If you’re the type of person who keeps too many files on hand, you’re most likely to demand a flash drive that will perform. And when we say perform, we don’t just mean a flash drive that’s going to save you thousands of files – we mean a flash drive that’s going to read and write and transfer data at the peak. So when Kingston, the world’s number one in terms of flash memory presence, introduced its latest USB 3.0 model, we gladly and wholeheartedly welcomed the newbie. The Kingston USB 3.0 flash drive looks similar to your ordinary flash drive. It’s a USB stick that you can put on your favorite keychain for ultimate portability. The only difference is that this USB 3.0 flash drive uses a USB 3.0 controller making it a top performer, and it has the ability to take care of all your documents, music, photos, HD videos and applications. The Kingston Data Traveler Ultimate 3.0 Generation 2 is a SuperSpeed flash drive that reads data with a speed of up to 100MB/s and writes at 70MB/s when plugged into a USB 3.0 port. 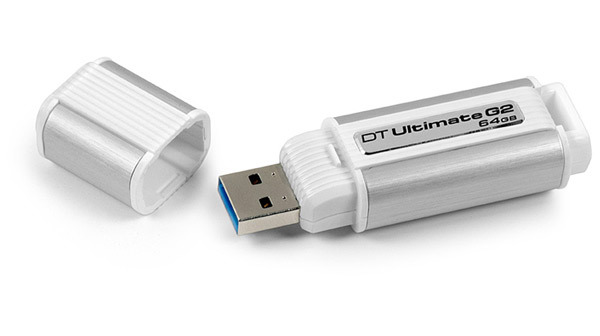 But then again, if your PC still lacks a USB 3.0 port, the Kingston DTU30G2’s backward compatibility will allow it to still record a notable read and write speeds of around 30MB/s on your USB 2.0 port, definitely not bad compared to a USB 2.0 to USB 2.0 port connection! Still, we wish Intel and AMD would do something about it, and why not do something about its price, too? The debut of the new 3.0 DataTraveler shows that the company is pushing hard for USB 3.0 mainstream adoption. Fortunately, it’s a part of an increasing demand and ever-expanding market for this technology. Kingston DTU30H2 comes in three sizes. The 16GB is sold at $77, the 32GB for $116, and the 64GB for $213. If you think it’s pricey, you may want to consider that all of these come with a 5-year warranty. Too expensive for your taste? Are you waiting for USB 3.0 flash drive prices to come down before you buy one? Or, are you ready to take advantage of the new technology? This entry was posted in Articles, Kingston DataTraveler, Kingston Technology, SuperSpeed USB 3.0, USB 3.0, USB 3.0 Flash Drives, USB Flash Drives and tagged 3.0 DataTraveler, Kingston Data Traveler Ultimate 3.0 Generation 2, Kingston DataTraveler, Kingston DataTraveler 3.0 Generation 2, Kingston DataTraveler Ultimate USB 3.0 Flash Drive, Kingston DataTraveler USB 3.0, Kingston DTU30H2, Kingston USB 3.0 flash drive, SuperSpeed flash drive. Bookmark the permalink.